East Japan Railway Co. on Friday unveiled to the media the ALFA-X, the test bed of the next-generation "shinkansen" bullet train, in Kudamatsu, Yamaguchi Prefecture. The 10-carriage train, which sports a sleek 22-meter nose on the No. 10 car, is expected to run at a speed of 360 kilometers per hour, 40 kph faster than previous models. 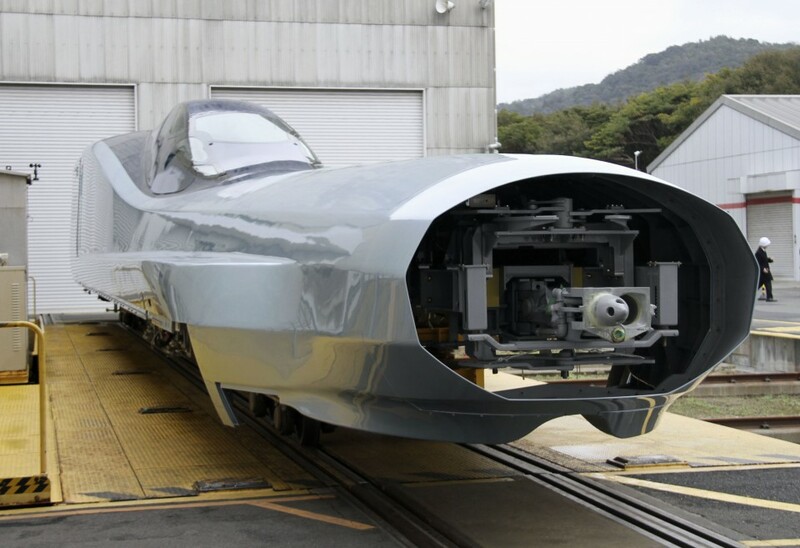 During the test phase JR East hopes to push the train to speeds of 400 kph. According to JR East, the silver train is being jointly manufactured by Kawasaki Heavy Industries Ltd. (cars 1-6) and Hitachi Ltd. (cars 7-10) and its completion is expected in May. The No. 1 car, which was unveiled to the media last December, features a 16-meter nose. JR East will analyze pressure and sound differences between the two noses when the train enters tunnels. The longer nose means a reduction in pressure and noise, leading to improved passenger comfort. However, because that will mean fewer passenger seats, JR East, through test runs, will look at ways to make the most suitable design. Koji Asano, head of the frontier railway system development center of JR East, said, "The extension of the Hokkaido Shinkansen Line will begin but our aim is comfort and convenience and will we will continue developments with that objective."